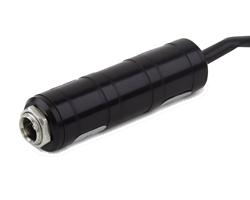 Global Laser’s 24 Volt in-line adapter provides a compact reliable solution to allow a wide range of laser modules to be powered from an industry standard 24 V dc supply. The solid state technology design transforms unregulated dc voltage in the range of 6 to 30 V dc generally found in industry machines to a regulated 5 V dc supply suitable for the reliable operation of laser diode modules. The in-line design keep any heat generated isolated from the laser diode module, thus ensuring reliability and maintaining laser diode lifetime. The compact 14mm diameter aluminium housing is voltage potential free, but allows good thermal contact for heat dissipation. Reverse polarity protection is also provided. A wide range off connection options such as DC jacks and flying leads etc allow the adapter to be used with a wide range of products and be simply integrated into popular systems such as the LaserLyte and LaserLyte-Flex. Four pin connector options are also available to provided integration with Global Laser modulatable laser range.